A rustic charm or shimmering glow – to achieve the perfect Winter Wonderland wedding you can take a bit of the Christmas Charm. This is true, whether it’s a roaring log fire or Christmas trees decorated to your preferred wedding colours. Other ideas from Mistletoe on the tables to decorated snowflakes and Reindeers for your invites. Or instead of champagne, opt for hot chocolate or mulled wine in clear glasses. A fantastic winter touch, that your guests will enjoy during the photos and it will line their stomachs too! ‘Don’t let the Weather get you down’. If the weather turns for the worst and the heavens open, make the most of it as you may capture the fun by kicking off your heels and making a splash. 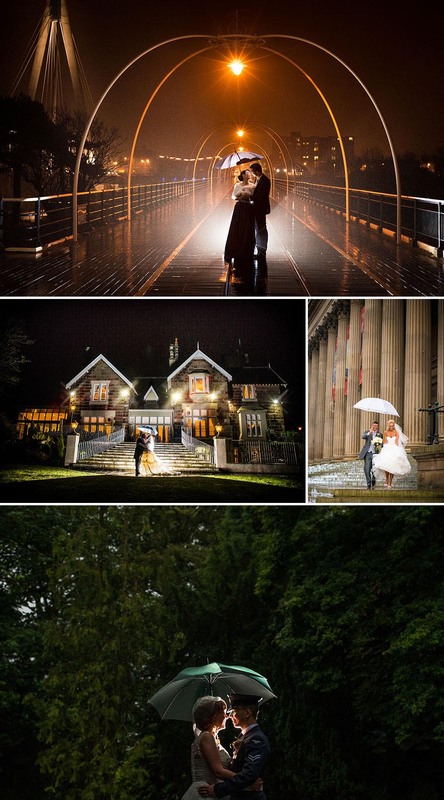 As people make a wedding – not the weather. Unpredictable winter conditions can actually provide stunning natural backdrops for your wedding’s photography. However, an idea of confetti may be a little old fashioned for some, so you can always have a snow machine to make the moment more special and fun. Take advantage of your towns decorations to capture the setting and place of your theme. Cold weather also gives couples the chance to accessorise their outfits. 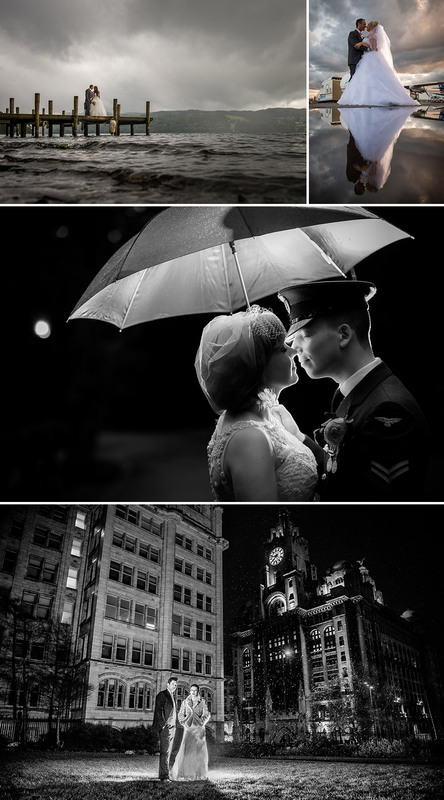 Whether it’s snowing, raining or one of those lovely crisp winter mornings, a good wedding photographer should be able to take some incredible shots. In fact, the weather will probably spark some interesting ideas for shots in a photographer’s mind. Favors are always a decoration that you want to be unique, so why not a mince pie or mini Christmas stockings with a festive chocolate, candy canes or candle. Even have guests sign a Christmas bauble ornament with his/hers names on and a wish for the newly-weds, a keepsake to remind you each year as you decorate your Christmas tree together for years to come. Instead of flowers to walk down the aisle with – why not try a crystal brooch covered bouquet which you can have as a keepsake – how many brides get to keep their bouquet? This will also be a lovely gift to hand down or offer it to someone as their ‘something borrowed’. If you’re wondering what to do for your table centre-pieces, go for decorated wreaths or red berries draped over a vase. Even frosted covered table numbers with snowflakes or jewels can be very effective – yet simple. Your guests can take them home and decorate their homes with too. 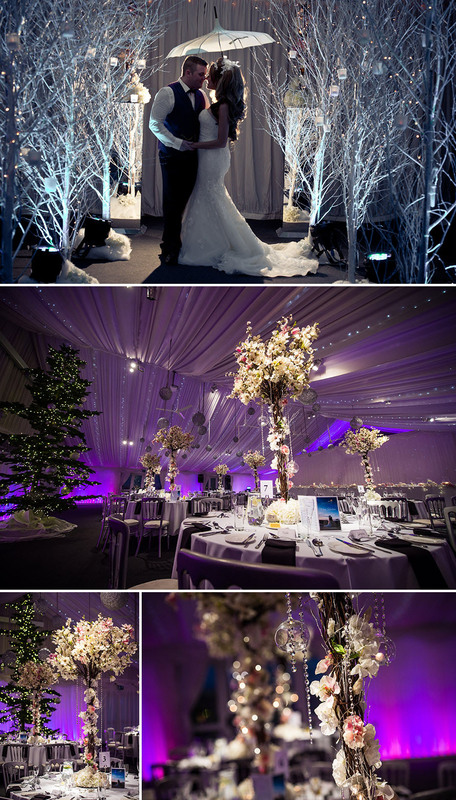 For a truly amazing winter wonderland themed wedding, see the below wedding photographs from Heaton House Farm taken Dec 2014, their venue was truly transformed with the most magical decorations by Qube Events, from Manchester. So, if you are wanting a Winter Wedding, then contact me for your preferred dates and lets make a start, bringing together your Winter Wonderland Wedding.